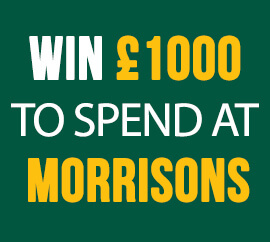 You’ve never needed more of a reason to shop at Morrisons if you win this super prize. OfferX are giving away £1000 cash to spend at Morrisons! With great offers every day you can fill your trolley for even less. Morrisons supermarkets’ boast a plethora of services to rival other big supermarket chains. From the ‘family butcher’ and ‘fishmonger’ providing an array of fresh and high quality meat and fish, to the ‘greengrocer’ that aims to source fruit and vegetables directly from growers where possible to keep the quality high and prices low. The Bakery provides super freshly baked bread, and the Deli counter offers a wide selection of meats, cheese and olives from all over the world. Or visit the cake shop and indulge in a cream cake, muffin or tasty pastry. With competitive prices and hundreds of special offers available on many products you’ll be able to fill your trolley with goods and produce that will feed the whole family! We’ve all heard of Amazon - the leading international online retailer with a vast range of products available – in fact, almost everything you could possibly think of! From cameras to coffee machines, DVD players to children’s toys, clothing to car accessories, there really is something for everyone! Offering such a huge selection of products available, enables Amazon to provide great offers and special deals at low prices. When you shop at Amazon your money goes even further! In addition to the great value provided, what makes Amazon so unique and popular is the complete purchase experience. They provide a variety of resources including customer reviews and personal recommendations to help you with your product choice. And the best bit?? 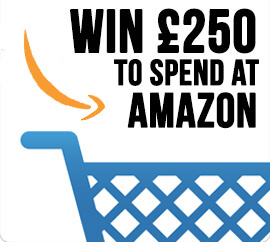 You could be walking away with a £250 Amazon gift voucher! !